Vibrant landscapes and eccentric traditions of southern Siberia await travellers in Tuva, a Russian republic that is barely inhabited and blessed with natural beauty. The population of the Tuva Republic is 300,000, the majority of which live in Kyzyl, the Republic’s capital. The rest are scattered randomly around its territory. A journey from one population centre to another can take up to five hours - this is an uninhabited region comprised almost completely of nature reserves, the majority of which don’t even have roads. Stock up with plenty of food and water because its unlikely you will find anywhere to purchase drinking water or even a sandwich on the road so if you do find an opportunity you would be wise to take it. The same philosophy should be applied to cash points in the Taiga, so it is best to withdraw cash ahead of time. 90% of the shops found in the republic are simply known as ‘Shashlyk’. Here you can get a big meal from someone for 30USD in 20 minutes. This consists of shashlyk naturally (which is known as a ‘Karbonad’) and Chorba (a thick, heavy soup made from lamb, a traditional dish for Central Asian people). For the first time it seems that civilisation’s many advantages are just not enough amid the wonders of local natural beauty. Mobile phones are available only in very specific locations. At this point the hustle and bustle of the big city feels like a distant memory. 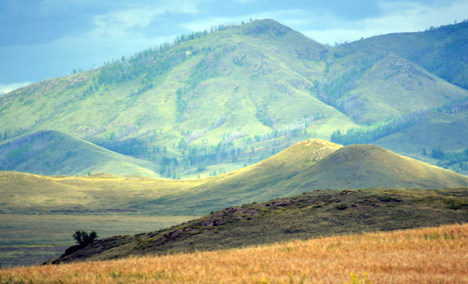 There are so many nature reserves in Tuva that they are separated from the rest of the landscape only by the presence of signposts, which are hiding behind dense vegetation in some cases. Tip: stock up with supplies of insect repellent. You have been warned! The weather in Tuva is terribly unpredictable. In the space of a few hours it can climb to +35 and fall to +5. It can be pouring with rain and then suddenly the sun appears. No sooner have you donned a coat to stop yourself from freezing, than you have to take it off to stop yourself from roasting. It rained for the whole three days we were in Tuva, and the sun rarely made an appearance. In small villages or in camps there is no running water therefore nature provides all conveniences and a Banya (steam bath) takes the place of washing facilities. Almost every house in the village has its own Banya, but there are communal ones. In the first location we went to the Banya was communal and mixed, so men and women would share. A towel helped to maintain decency. Tuva was the very last of the republics to come under the Soviet Union. Taiwan still lays claim to Tuvan territory and Tuva remains in a state of war with Germany. The history of Tuva is meandering and complicated, so Tuvans relate to everyone around them in a unique way. The situation is also complex when it comes to religion for Tuvans. Russia’s chief shaman lives here to this day, who in his time read fortunes during the election of the first President of Russia Boris Yeltsin. Buddhism is Lamaist in Tuva. The Dalai Lama came to Kyzyl once in 1992 and set up a ‘holy temple’ in the centre of the town square. There is a statue of Lenin on that same square - this juxtaposition does not cause anyone any confusion. Over Lenin’s shoulder beyond his statue a peak in the mountain range can be seen, on which a holy inscription is set out in stones in the Tibetan language. This marks the spot where in 2015 a 20-meter statue of Buddha, the biggest in Russia will be erected. On the road you often encounter trees with branches that have been embellished with multi-coloured ribbons - these are holy places. The idea is that anyone looking for safe passage should hang a ribbon on the tree. These rudiments of pagan cults can be encountered everywhere. Places of power, with spears driven into them on the tops of the hills, which women are forbidden to climb and small pagodas in wooden Buddhist temples. You should scatter small change all around ‘for luck’. It is best to stock up with small change as there are a great many such places, both on the steppe and in the mountains. Tuva is nothing like the tourist destinations in the Mediterranean. Tuvans are free from corruption from outside influences and are indifferent and unassuming in the nicest possible way. It seems that the only thing that is truly protecting them is the cost of the cheapest one-way airline ticket there from Moscow - 385 Euros. Eco-tourism in Tuva does not exist. This was confirmed when we asked about the popularity of eco-tourism in Tuva. ‘How is that?’ we asked, as we had just passed through the Sayano-Shushenk nature reserve and we saw several clusters of little houses, which are clearly not built to be lived in, they were beautiful, and well concealed against the greenery next to a mountain stream. ‘They are hotels and rest houses’ the locals answer disdainfully, buses are always bringing Russians or foreigners here’. Two buses full of foreign tourists were behind us in the museum, in the ethnic cultural centre of Altyn-Bulak. Periodically on the road somewhere in the vegetation of the Taiga we caught glimpses of the red rucksacks of backpackers.